A child’s first tooth is often cause for celebration - but experienced dental professionals know it’s also a great time to educate parents on the looming dangers of tooth decay. 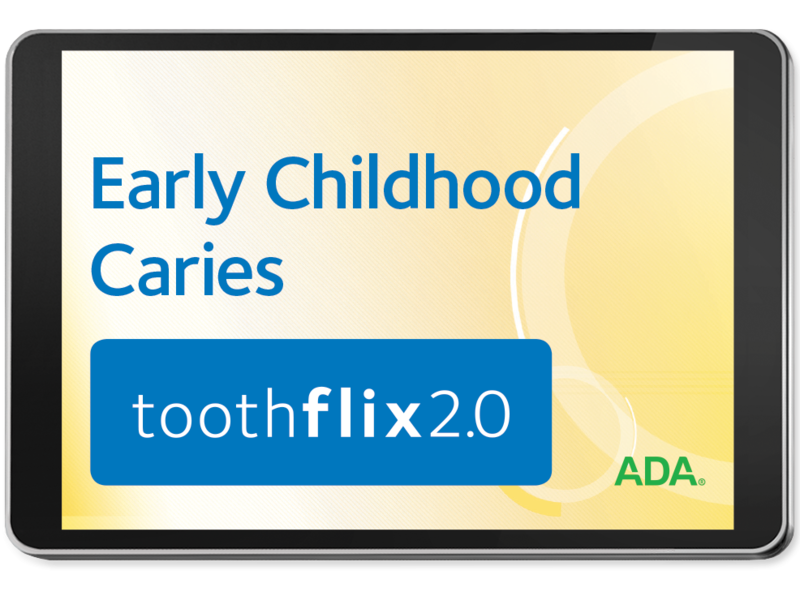 Early Childhood Caries, part of the Toothflix® 2.0 streaming video series, is a great resource for helping parents identify potential methods for accidentally introducing harmful bacteria, and how to establish effective oral hygiene habits in infants and young children. It contains all the up-to-date content you’ve come to expect from ADA’s standards of clinical excellence, now with the added flexibility to show from any web-enabled device. By showing parents this powerful video, you’ll help make sure they instill proper cleaning and oral health techniques in their children, which can lead to a lifetime of benefits. After purchase, the video is easily accessible by visiting your online ADA e-Bookshelf portal. For more information, and a full list of videos, check out ADA.org/toothflix. Help parents put their children on a path to impeccable oral health by purchasing your copy of Early Childhood Caries today!